Now here is fish that I can't get enough of. 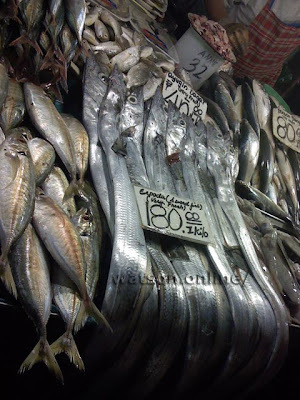 Locally, it's called Espada (or swordfish in English. Not to be mistaken with the sport fish). If you look at it closely, the Espada looks really wierd. Its rows of pointed teeth are showing, and with its eyes staring at you, you'd think this fish came from the depths where fish have their own luminescence because it's so dark, and where marine life looks out of this world. But this is one of my favorites. Fried is my preference. I wonder if this is related to the Black Scabbard Fish of Madeira, Portugal (which they call Espada Preta in Spanish). They look like each other, save for the color. 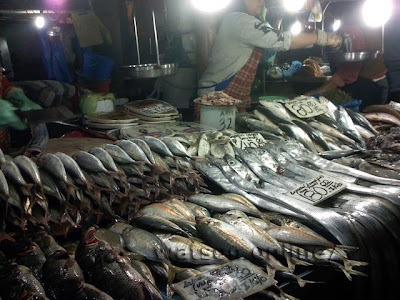 The Espada is not a regular sight in the wet market of Baguio City, the Philippines, as fish are imported from the lowlands. So when there are some available, expect it to be the first to be sold out. Ang mahal pala ng espada ryan, dito around SR8-10/kl lang.